Interested to learn forum thoughts on an ideal violin bow stick bending geometry, as it relates to differences between wood and carbon fiber implements. Hi all. 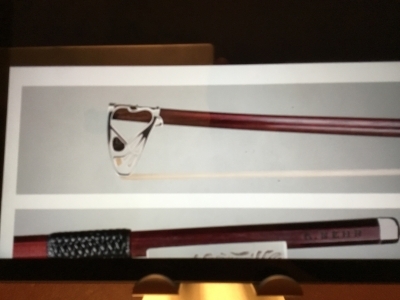 I would like to make a pattern for a split bamboo violin bow stick. 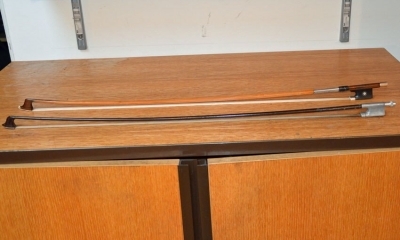 Unlike wood, the bending geometry of a split bamboo bow stick is "set" during the glue up and cannot be changed by heating under an alcohol flame. The stiffness of bamboo is less than carbon fiber but much greater than wood. 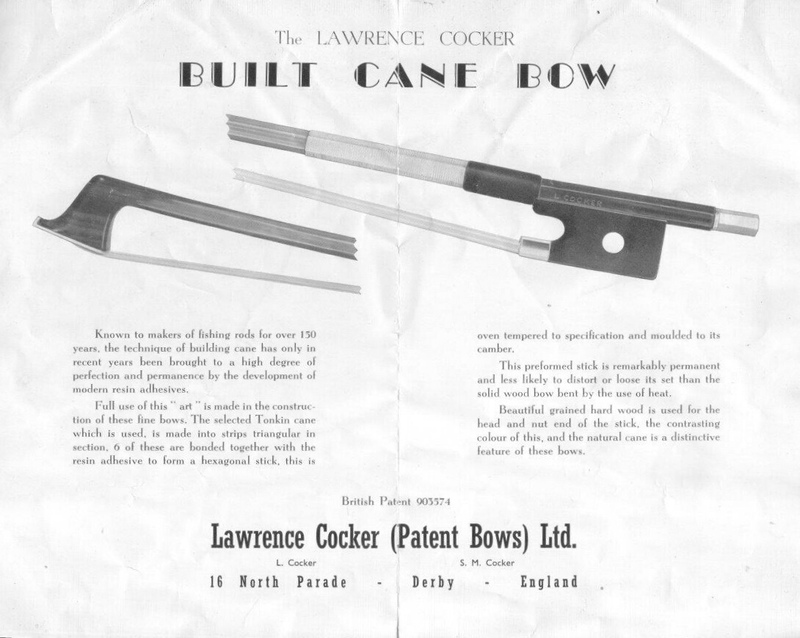 I have been able to find some photos of the bamboo bows made by L. Cocker of Great Britain to use an example and have obtained several carbon fiber and metal bows for comparison. I think that I can obtain the bamboo stock already "roasted" by the use of bamboo floor planking. I plan to set the cross sectional angles by the use of a table saw. Bamboo an interesting choice of wood for a bow. Is it worth a luthier studying antique fishing rods? Hi Andrew Fryer. I have several requested books on the making of split bamboo fly rods on order at the library. No doubt I will have to purchase some more. 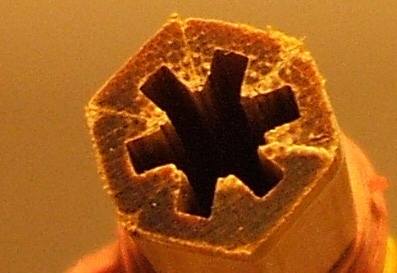 L. Cocker used a most interesting scarf joint on the tip end (see photo as viewed from above). Looks beautiful. One of my regrets is having no talent at woodwork. i know you can’t use them for a bow but maybe you’d like them to look at for ideas and comparisons? Steve. Thank you for your kind offer. I think that I should be OK with the reading material, but don’t use them for kindling because I may take you up on it. I have heard that it takes 10,000 hours to master a subject, but I think that the learning curve is initially quite steep and I want to give it a go with about 50 hours. Mr. Cocker appeared to be very concerned about the stress induced by the hair to use such a long scarf joint at that position on the stick. He also scarfed on rosewood at the frog end of the stick. I am planning on using a piece of bias weaved carbon fiber tube which I will stretch “Chinese Finger Cuff” style over the bamboo and secure with thin epoxy. 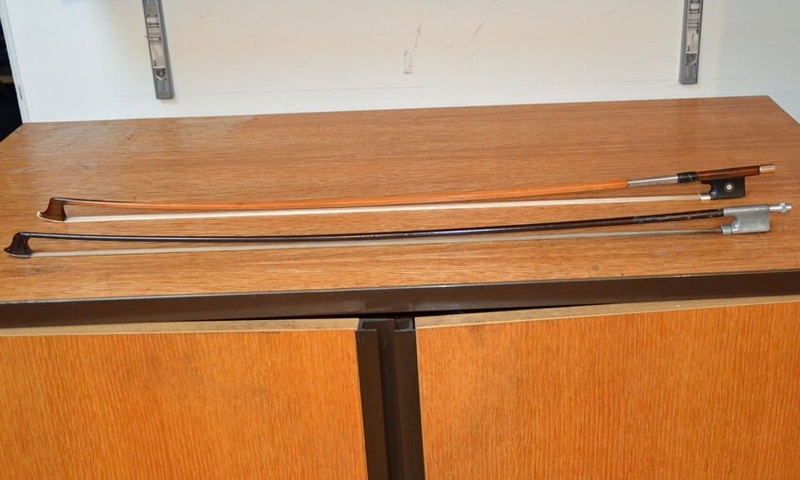 I found a photo of a Cocker bow and the curve appears to be very gradual (see below). I found an advertisement used for the L Cocker bow, for those interested. I think that I found the study that meets my needs. 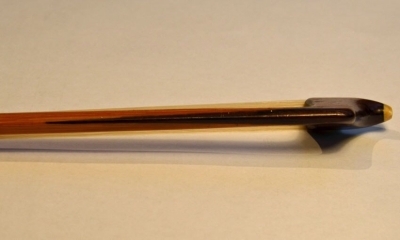 Check out “The violin bow taper, camber, and flexibility” by Colin Gough, 2011 Acoustical Society of America pages 4105 - 4116 (I found it on the internet). The formulas will also work for the viola, cello, and string bass. Another potential advantage of using split wood or cane to make a violin bow is that is possible to remove core material without lessening the stiffness of the structure. A small amount of weight loss toward the bow tip will advantageously decrease the experienced moment arm, which should make playing easier. It will also decrease the inherent frequency of the bow. I don’t know if this a good or bad thing. That's pretty impressive looking craftsmanship, @Irv ! So the idea is that you glue those 6 identical, long cut out segments together and add camber while the glue sets. And after that, you hand taper to taste? Hi bocaholly and others. The L Cocker segments were 6 sided and he scarf jointed an 8 sided piece of wood on the handle end so he could use a conventional frog. I want to use 8 segments of bamboo and avoid the scarf joint. This adds difficulty since all of the tooling used in the making of bamboo fly rods is dedicated to 6 segments. To answer your question, all of the tapering will be done before the glue up. I am using the log function found in the paper mentioned in the post on this thread before the bamboo close up, although a straight taper would be easier. Using an insight found in the same paper, the characteristics of the unbent stick determines the correct bending camber when provided with the offset load through the bow tip. So simple I would have never thought of it. An interesting characteristic of bamboo is that all of the fibers that give it strength are located on the outer surface, so all of material removal is from the inner surfaces. @Irv So not only are you going to make the bows... you're actually going to make the tools to make the 8-sided bamboo bows first?!?!?!? I'm rooting for this to sound awesome! The machine that I am currently constructing is a bamboo rod string binder. The segments are secured together with string and heated to remove moisture (bamboo contains a lot more moisture than wood) and “hardened” with a few minutes exposure to 350 F, and again bound when glued. The strings are wound in two directions so that the sections are not twisted. It is worth looking at a YouTube video on the process since it is very neat how to do it. I am going to separate the moisture removal step and the hardening step, and swap the stick in aluminum foil so I can roast it. That should be a first. I have no idea how to use a 3D printer, but I do have a background in computer aided design. As a long term goal, I would like to make an engraving pattern of a metal violin bow head similar to this photo, and cut them out with a pantograph. The local library has a 3D printer in their makers room.